This photo, taken from our balcony, is going to make my acrophobic father squirm. View of the Seine as we walked along the berges on Sunday, after a huge rainstorm, while the traffic was banned on the highway that runs along the left bank, near the Esplanade des Invalides. Notice the tourist tourboats, the beautiful golden statues on the Pont Alexandre III, the ferris wheel (round white thing on the right) at the Tuileries, near the Louvre. 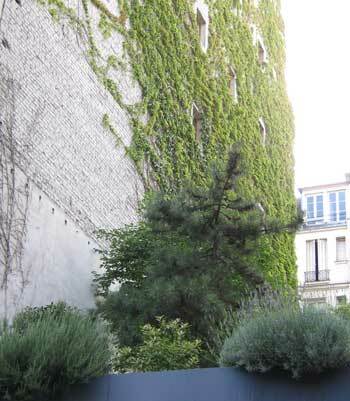 Upper-level rooftop garden in the 15th arrondissement. 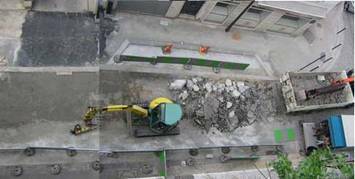 Every weekday, beginning at around 7AM, we hear chunks of stone and concrete being loaded into a truck directly in front of our building. That is fairly noisy. But the real noise starts slightly after 8AM when a jackhammer begins pounding the pavement in the street into more chunks that are then loaded into the same truck. The jackhammer (green and yellow machine at left) shakes our entire 7-story building. The photo at left is taken from our balcony on the 6th floor (what they call the 5th floor here, because ground level is 0, not 1). Actually, the photo is two photos that I stitched together to show the extent of the work. The street is closed completely to traffic, and the sidewalk on our side is closed from our front door to the corner. Every time we come and go, we have to walk around this site of deconstruction and new construction. Under the layer of blacktop that is being removed is a beautiful layer of old granite pavers that is also being removed. The granite is arranged in an attractive, fan-like, repeating pattern, seen in many places throughout Paris. One ironic aspect of this project is that after the old blacktop and beautiful old granite is removed, a layer of concrete is put down (the medium-dark gray area on the left in the upper left photo) and at every intersection, beautiful new granite pavers are installed in exactly the same pattern as the old stuff that was under the blacktop. This commercial revitalization project must be terribly expensive. And it sure is noisy. Fortunately, there is only a 35-hour work week here, and since these guys start at 7AM, they stop somewhere in the middle of the afternoon, when we have peace and quiet again. In fact, then it is VERY quiet because there is no traffic going through. Yesterday evening, all four of us had a lovely walk through the 15th and the beautifully landscaped Parc André Citroën before dining at Le Tire Bouchon. Dan had the “gourmand” menu, which includes an appetizer, both a fish course and a meat course, as well as sorbet in-between those main courses, and the “ronde” of desserts. He was so full he was in pain afterwards. Madame Houry treated us all to the sorbet course before our main course, which was very nice of her. Alas, this was our last dinner with Dan and Mary this summer because they are leaving for home today. We will miss them a lot.